Unless they are polished a bright yellow color, yellow fingernails are as unwanted as yellow teeth. But many things can turn your natural fingernails yellow, from nail polishes themselves to even certain medications some people take. But don't worry, I got your back, or your nails! *if you have any cuts or torn cuticles you might want to wait to they heal, because the lemon juice will sting any cuts like cray cray. 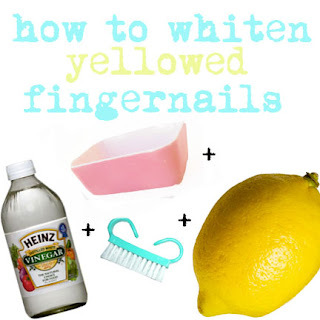 Fill a small bowl with water, enough to submerge all your fingernails or toenails. Squeeze the juice of an entire lemon into the water. Or you could try squeezing concentrated lemon juice- enough that it looks like lemonade. FOR A MINUTE OR TWO, OR THREE IF THEY ARE REAAAAALLY YELLER. If you wanna visit kandeeland for a minute and see what's goin' on in my world, CLICK THIS.